Hey guys, this is going to be my guide on upgrade priorities for Town Hall 8 players. What the most important upgrades are and what you should focus on upgrading the most. I also have another upgrade priority video for TH9 players as well, so if you’re ready to move on to TH9 and are wondering what upgrades to focus on, I’ll have the link to that video in the descriptions below. I will rank each upgrade and also give you a brief explanation as to why I believe it to to be important. The first and most important upgrade is the Laboratory, so make sure you have a builder ready to upgrade the Lab immediately when you upgrade to TH8. This is because you really don’t want to delay your troop lab upgrades. It take a very long time to complete all your lab upgrades at TH8, longer than your defensive upgrades. Now before you upgrade the lab, you should start a troop upgrade. It takes 4 days for your Lab to complete its upgrade. So if you have a troop that still needs to be upgraded, it’s a good idea to start that upgrade in your lab and then upgrade the laboratory. Dark Spell Factory is definitely one of the first things you should get immediately after upgrading to Town Hall 8. The Poison is extremely helpful from now on, which can helps you remove most defensive troops in both farming and Clan Wars. Also, you will want to upgrade it as soon as possible to get the Earthquake Spell. The simple ZapQuake combo (2 Lightning Spells + 1 EQ Spell) can take down any Air Defense and you can dominate at early-mid Town Hall 8 with just Dragons! I know a lot of people prioritize Army Camps over the Clan Castle, but the extra space in your Clan Castle is very important. An Army Camp upgrade gets you 5 extra camp space. While a Clan Castle upgrade also gets you 5 more space, but there’s a big difference. The Clan Castle can also be used for defense. The Clan Castle is just overall better than 1 Army Camp. At Town Hall 8, you’re able to upgrade your drills to level 3, which is a big upgrade. Lv 3 Drills produce 45 DE per hour, so with 2 of them, you can make 1,080 Dark Elixir per day for free, so that helps significantly for upgrading your Barbarian King and your Dark Elixir troops that are important for wars. Your Barbarian King is your best troop and he’ll help you a lot in wars and farming, so you shouldn’y delay his upgrade. Focus on farming Dark Elixir and upgrade him to level 10 as soon as possible because that’s when you unlock his level 2 Iron Fist. And there’s a very significant difference in power between a level 1 Iron Fist and a level 2 Iron Fist. At TH8 you are given a a couple of new defenses, so don’t leave them at level 1, but upgrade them to level 5 (Archer Tower, Wizard Tower, Mortar, Tesla) as they will still be able increase the overall strength of your base. Defenses get the biggest increase in DPS at lower levels. So upgrading these new defenses to level 5 quickly will help substantially in defending both in wars and when you don’t have a shield. With level 4 Dark Barracks, you get to unlock one of the most fearsome troop in the game, the Golem. However, you don’t really need the Golem at TH8, just because Hog Rider and Dragon attacks are much more effective in wars. So it’s up to you if you want to upgrade your Dark Barracks to level 4 this early for the Golem and additional training space. Otherwise, you can simply do the Dark Barracks at the end of TH8. Skeleton Traps are very good defenses as they can distract the Archer Queen or Barbarian King while your core defenses are able to deal more damage. They are also a very important defense for stopping Hog Riders in wars. They can also be set to air and distract Dragons, allowing your Air Defenses to deal more damage or even pull the Dragons away from your core. These traps only take 6 hours to upgrade to level 2 and they make a very big difference in raids. So it’s definitely worth it to get them to lvl 2 immediately. Your Air Defenses are the most important defense at TH8 simply because a mass Dragon attack is among the deadliest war attacks at TH8, and also doesn’t require much skill to easily annihilate a TH8. So your best defense against these Dragons are your Air Defenses. Level 6 Air Defenses make a very big difference compared to level 5 Air Defenses, so if you’re serious about wars, then you should upgrade your Air Defenses as soon as possible. If you’re looking to protect your loot against some of the most common attacks such as Barch, BAM, or GiBarch, then the Wizard Tower is a very important defense for that. Unlike the Mortar, the Wizard Tower has less range, but inflict splash damage much quicker and also be able to target air. 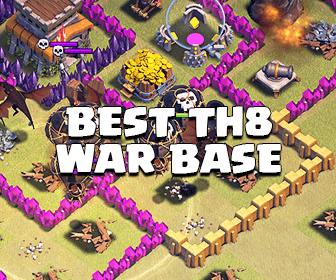 Hidden Teslas are your strongest point defense at TH8, so they should definitely be at the top of your list as well. Now some people underrate the Tesla because of its low range and long upgrade time, but it’s definitely worth it to max out your Teslas before your Archer Towers. Hidden Teslas only occupy a 2×2 area, which means the total area they occupy is 4 square tiles. While a defense such as an Archer Tower occupies more than double, 9 square tile area. Why is this important? This is very important because this allows for Teslas to fit just about anywhere in your base. 2 Teslas occupy a total of 8 square tiles, which is still less than an Archer Tower. While your core can be improved a lot on defense just by adding Teslas to it, which is very easy to do without having to use up so much space. Not only that, Hidden Teslas can sometimes be unpredictable, as they are hidden. They also fire rapidly, and are excellent for taking out heroes and tanks, especially Pekkas and also be coupled behind high HP Storages to deal a lot of damage to threats such as Dragons. So yea, don’t underrate Teslas, they are very important for successful defenses. The Air Sweeper is actually a very important defense at TH8 because of how deadly mass Dragon attacks are at this Town Hall level. There’s also only one of them at TH8, and it makes a much bigger impact against Dragons compared to Archer Towers because of their ability to slow down the very slow Dragons, allowing your Air Defenses to deal additional damage. So if you’re serious about wars, then you should definitely max your Air Sweeper before your Archer Towers. Unlike a Tesla, Archer Towers occupy 3×3 tile space, but have a 10 tile range. At TH8, you have a total of 5 Archer Towers, and they all make a very big concerted impact against aerial attacks and also ground attacks. However, they are usually place at the exterior parts of a TH8 base just because of the large space they occupy. They also have great range, so that allows them to protect the core areas while not having to be in it. Still, Hidden Teslas are just overall better and can fit inside your core better, so prioritize maxing Teslas first. Mortars are very important to have at level 6 because unlike a Lv5 Mortar, a Lv6 Mortar can take out Lv6 Archers in 1 shot, which is very important for defending against TH9s. However, the reason I have Mortars ranked this low is because of their very low significance in wars, as they are horrible against Hog Riders and can’t target air troops like Dragons. While Wizard Towers are significantly better for dealing with Balloons and Hog Riders and can also help deter those TH9 Barch attackers. Cannons are not useless, but they are simply the worst defense for a TH8. They only have a 9 tile range. They shoot twice as slow as an Archer Tower. They are unable to target air troops. All of this make Cannons the worst defense and so they are ranked this lowest. However, the great thing about Cannons are, they don’t take too long to upgrade and they still do a decent job against tanks, especially the opposing Barbarian King. But still, they should be at the bottom of your priority list. A level 3 Giant Bomb only gets a 25 damage increase from a level 2 Giant Bomb, and also no increase in range. This is a very small upgrade, and won’t really have a big impact against Hog Riders because 2 level 2 Giant Bombs will still be able to knock out the Hog Riders. The last thing on your list should be walls. Now this does NOT mean that you should upgrade your walls last. I repeat, it does NOT mean that walls should be upgraded last. Walls require no time to upgrade, they only cost Gold. What this means is that all of your excess Gold should be used to upgrade your walls when you have a Builder freed. That should conclude this guide. If you have any questions, ask below. Also, keep in mind that many players have different opinions on what to prioritize upgrading and it could differ based on the type of player you are. Such as if you’re a more war-oriented player than a farmer, then you may want to focus on the Air Sweeper and Hidden Teslas before the Wizard Tower. 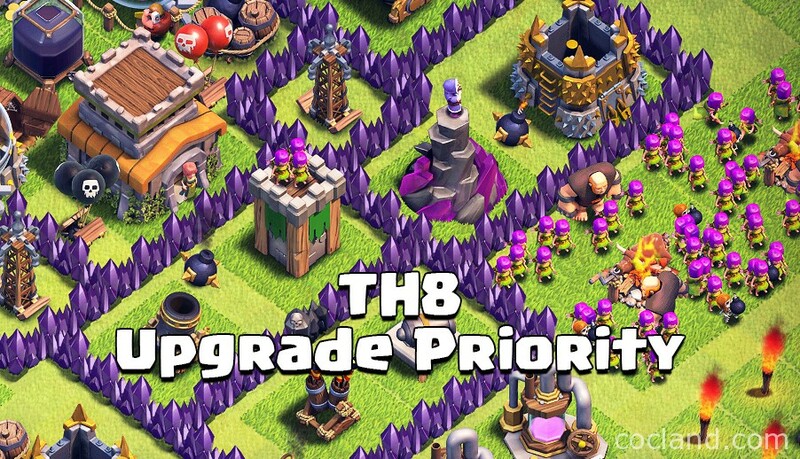 Also, If you are going to upgrade to TH9 soon, you should take a look at this TH9 Upgrade Priority Guide, I am sure that It can help you a lot. 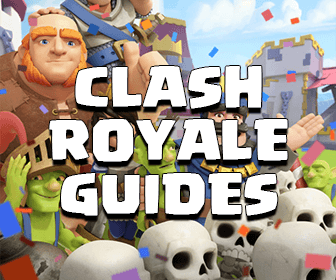 Hope this was helpful, if it was then I would really appreciate a thumbs up and also subscribe if you haven’t because I’m going to have a lot more great guides and content on this blog. Also, I get asked a lot if i am or own cocland and stuff, don’t want people confused, I just write guides and help cocland improve the quality of this blog. Thanks for reading and I’ll see you guys again soon. Later!